Description: Gone is the heaven-storming, Rachmaninovian Romanticism of Mathieu's teen-age concertos in these elegant, two-movement works of around 17 mintues each which date from 1951 and 1953 (it's not by chance that Chausson's Concert is the program coupling). There is plenty of activity and emotion but it seems to be refracted through the Gallic lens of Franck and Ravel, with intriguing elements of shade and light, instrumental color and subtle gradations of emotion and overall it plainly marks a new development in Mathieu as a composer, making his early death even more frustratingly sad. 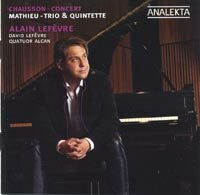 Alain Lefèvre (piano), David Lefèvre (violin), Quatuor Alcan.